What happened to the C kite love? Whats the reason for the general lack of interest in C kites in the last few years? Is it that the do-it-all open-C kites have gotten so good that they are good enough for the general rider? What characteristic of modern C kites has caused people to lose interest in them? Will the release of the new Ozone Amp that promises to be a "User-friendly progressive C-kite" change this? Lots of questions... I'm curious what the forum thinks. Some of you used to rave about C4, Vegas, Fuel etc but not any more, what happened? Re-sale! No one wants to buy a secondhand c kite because they know it's been flogged. Kites like the RPM still have to freestyle capabilities but won't blow your head off. I still have fuels in the shed, and after riding a core impact last week, it brought back memory's of the airush razors and what a weapon they were. But back to your question, really I think it comes down to resale for most . My gut tells me it's a combo or re sale and that a lot of riders are doing multiple disciplines these days. While a C kite is probably the most versatile kite out there, its not to your average person. I LOVE MY VEGAS (North) 2017! Try one 10m in 30 plus ?????? When I learnt to ride I had a Slingy Fuel 17m - I thought kitesurfing was just a low wind sport and Id stick to the windsurfing for the better days . I'm sure the newer C kites have better wind range than the older ones. I had the 2003 Cabrinha CO2 in 9 & 12m and the 2004 Cabrinha Nitro in 14m. When I gave them away to a local kite repairer to use the valves, fabric etc and bought a new kite I had about the same wind range out of my 2010 Switchblade 10m that previously took a 3 kite quiver to cover. Plus, relaunch on those old C kites was shocking, that has probably improved too. Tick for Razors I can be working 12m Reo in light wind and my son gets more out of his 11m Razor both on surf boards.. about same weight too. All C kites like moving rarely park and ride. He goes from strapless surf board to TT &boots on either 9 or 11m Razors. At flatwater spots I see mainly C kites. C kites for unhooked spider monkey mischief. Most don't and/or couldn't ride like that. Other kites have differentiated Over the Years for the other specific styles we do. i prefer C kites for waveriding. they pivot on the wingtip which generates and holds far more power through a turn than a bow/SLE/toenail kite. so when you do need to rely on the kite to change direction, set up a turn or get out of the **** there's a heap of grunt available. SLE's kind of pivot close to the centre axis and are more gutless through the turns. i reckon c kites also drift unhooked just as well as SLE's, and relaunch is all down to practice & technique. If you want to learn landing blind, do handle passes and air swaps you definitely want a C Kite. If you only want to boost, cruise and do simple hooked in tricks, you can get any kite... There are kites that boost better than the other, so you will have to choose the one that is most suitable for you. Freestyle progression only on ta C-Kite. If you want to learn landing blind, do handle passes and air swaps you definately want a C Kite. Last night I was out on the river and as the low came in it got even more gusty than usual. I started on my 9m Enduro on the freestyle setting but I find these kites are not that great at absorbing gusts, they really give you an uncomfortable yank when a gust hits. I switched to an older model 9m Vegas and didn't even have to adjust the trim, it has a much better ability to absorb gusts (almost like it's on an elastic). Is this a C kite attribute or specific to the older Vegas? This makes a big difference to my enjoyment of a session when there isn't a stable sea breeze. Any Vegas not just the old ones. 5 lines, with the fifth loaded. No bridals. And relatively high Y. Rebels the same. Nothing absorbs gusts like that kite... period. F-One started to do C-kite with the WTF model last year ... after a decade of Bandit. A bit weird to start in 2018. Not really following the global trend that give up a bit on C-kite. Used to ride Torch, then Vegas for years, and I tried the WTF ... was pretty good for me. Yeh I've heard the WTf is a decent C kite to from an exceptional rider who rides Vegas kites. He was impressed with it. Great response and also it's great to have such an honest opinion from someone who I'd have to admit it I admire. Now back to ripping it up please! So one would one be better off with a c kite when starting to unhook versus an open c kite? I understand pros can do a lot of things on any kite, but what would be best path for the weekend warrior looking to progress into freestyle? I'm sure Better equiped people will answer but ... I spent a couple of hours knee deep in water at the pond with Sam Light the other week (he was running a 10 day clinic) and he was pointing out some of the young riders in the clinic were struggling to land even a basic S bend to blind with a surface pass using hybrid C kites like say a dice. He said they are just too fast. Of course they won't ever deliver as much slack anyway but the main reason (he was pointing this out in real time as riders crashed) a pure C kite will sit there better and not love too much. In his opinion (and he's worth listening to) just bite the bullet and get a full blown C kite if unhooking is your main focus. Thanks Eppo and Karolina. I will try one, probably a vegas, before swapping my quiver. I'll tell you the real reasons. 1. Because brands are mostly putting no time and effort into R&D and marketing for them. Majority of C-kites on the market are 10 year old designs. Also brands try to make C-kites that jump and Loop big in combination with a kite that is also good for unhooking... unfortunately these two things are basically opposites. It's like making a race kite that's good for wave-riding. 2. The other reason is that the majority of people who sell kites don't ride C-kites, they perpetuate the myth that "c-kites are dangerous and hard to ride", thus it's an uphill battle to convince people they will actually progress their riding if they get one. The truth of it is, C-kites aren't dangerous. Old kites were dangerous and it just so happens that the only kites that are old are also C-kites... thus you get this mixed info. If you really believe C-kites "are dangerous", "have no depower" etc. you're full of it. Go try an AMP and tell me that's the case. Once brands start updating their designs people will start progressing again and these types of kites will get more popular. I've seen so many people trying to ride SLE kites and getting no-where, the sad thing is they don't even understand how big a difference a C-Kite (with 5th line) would make. The 2012 Ozone C4 (prior to its radical design change in 2013) is a total ripper. I still fly them and love them. The ozone Amp has caused a massive paradigm shift in my own understanding and appreciation of C kites. What an Incredibly stable and versatile wing yet slacks like a sumo wrestlers G string. 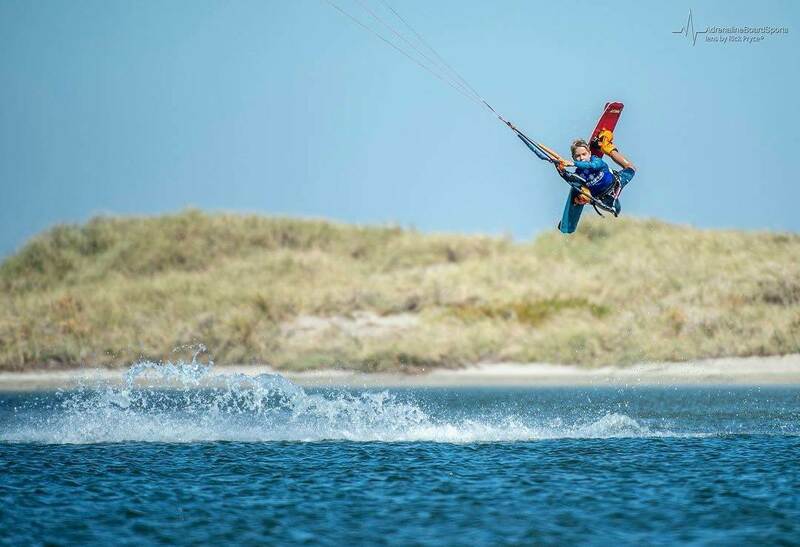 This 11 yr old rode it for half an Hour the day before and then was doing this the next day in the nationals on a 9m in 18- 20 knots(he weighs 35kg) ... what's your excuse ? He's been doing bloody board offs now down our local and loopin the damn thing. That's bloody awesome Eppo ! Future champion right there !! I was stoked to see it! Really does show you how much the right equipment can help. Not many get to start with such a good understanding of the technical stuff, and a dad who's keen to get them out there! I'm not sure I'm helping too much with the technical stuff... lol!!! My twinkle toe board offs don't help much. Tapping into better riders than me for that. 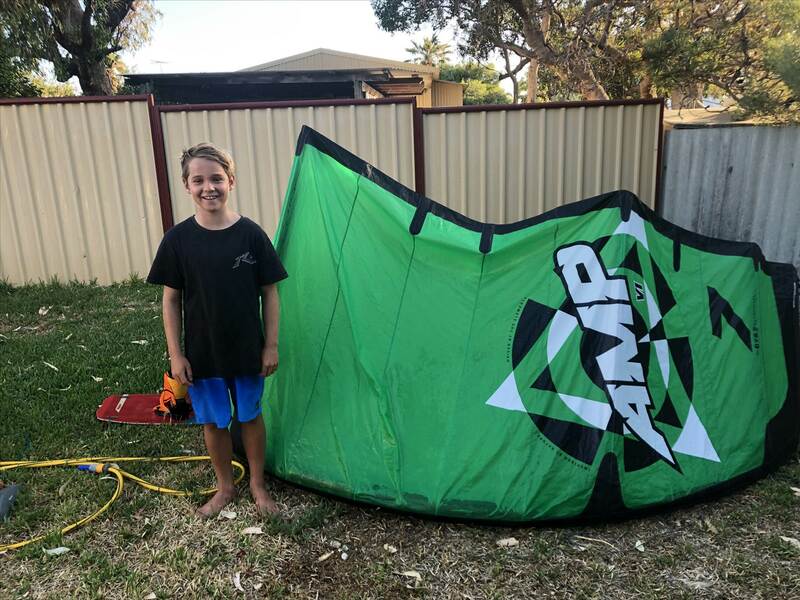 And this very proud dad didn't mean to hijack the thread... if you are looking for a C kite that will help you progress fast and is easy to use at the same time (and really versatile) I'd be looking at the Amp.